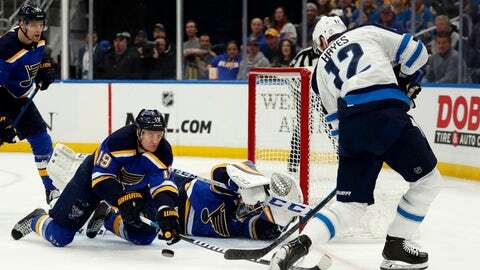 Jordan Binnington allowed six goals on 29 shots in the Blues' loss to the Jets on Sunday night. NOTES: Blues D Robert Bortuzzo suffered a cut on his hand that required seven stitches in the third period of Game 2, but played on Sunday. … Winnipeg is 1-10 in playoff games decided by one goal, including a 1-4 mark last season. … The Blues failed on their first seven power-play attempts in the series prior to Perron’s first-period goal. … The Jets were the last playoff team to record a third-period goal this year.